This vibrant, wide-ranging documentary examines the impact on contemporary Maya culture of changes in the lives and expectations of Maya women in Guatemala. Traditionally, weaving and textiles have played a central role in the lives of Maya women. 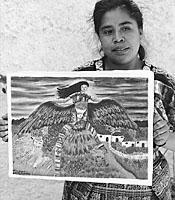 Today, however, Maya women are expanding their vision of their identity and their role: although they maintain important links to their cultural traditions, they are seeking greater access to education and entering such fields as teaching, health care, marketing, and painting. The film examines the lives of a number of these Maya women and explores their efforts to improve their social and economic situation and at the same time perpetuate and revitalize their rich traditional culture. Produced by Kathryn Lipke Vigesaa.